or browse the information and videos below. A passing jet gets a close view of the partial eclipse of 2014-10-23 at 5:55 CDT in Austin, Texas. Questar 3.5" with Sony NEX-5N at prime focus ISO 200 for 1/60 sec. Deconvolved in Lynkeos, final adjustments in Photoshop. The plane is about 60 miles away. The path of totality will extend from Oregon (starts 10:15 AM PDT) to South Carolina (ends 2:49 PM EDT). It will cross the USA in about an hour and a half, with the shadow traveling at a faster than super sonic speed. Under clear skies, it will be a memorable event. Totality lasts only about 2 minutes at any spot along the center line. 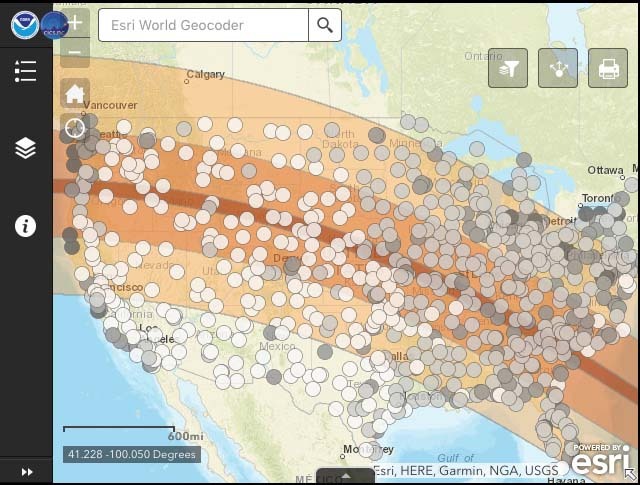 The ESRI NOAA eclipse viewability map below shows where the total eclipse will be visible and the historical chances of a clear sky during the eclipse based on 10 years of hourly data. More information on traffic and travel times on eclipse day is available from Predicting eclipse visitation with population statistics by Michael Zeiler. The NASA Eclipse site includes estimated times for each phase of the eclipse from any location in the USA. From Austin, about 65% of the sun will be obscured at maximum. The eclipse will start at 11:41 AM CDT. Maximum eclipse will be at 1:10 PM. 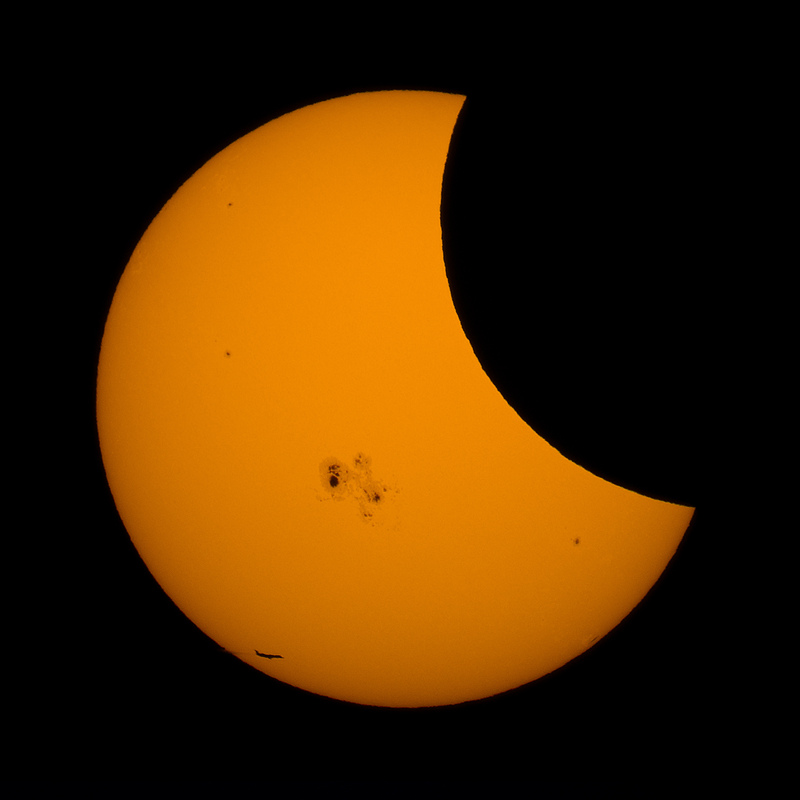 The partial eclipse will end at 2:39 PM. If you can get to the path of totality, now is the time to make your plans. Read my suggestions for safe viewing of the solar eclipse. If you can't make it to the path of totality, you can find eclipse events in Texas.